In a new study from researchers at the University of Leuven, Belgium, scientists have discovered errors during the earliest stages of embryonic development that can lead to entire sets of maternal and paternal chromosomes segregating into different cells, resulting in chimeric embryos. “This is a novel fundamental insight into the origin of chimerism, a very rare condition in humans which can lead to birth defects,” explained senior study author Joris Vermeesch, Ph.D., professor of molecular cytogenetics and genome research at the University of Leuven. Typically, single-cell embryos contain a set of maternal and paternal chromosomes, and as the embryo grows, daughter cells receive a copy of each. However, previous research involving in vitro-fertilized human embryos have demonstrated substantial fractions of embryos that contain at least one cell with either whole or partial gains or losses of chromosomes. This chromosomal instability can lead to reduced proliferation and birth defects. To investigate in more detail, the research team employed in vitro fertilization (IVF) in cattle as a flexible system to study chromosomal changes in single embryonic cells. Using a single-cell genomic technique they developed previously—called haplarithmisis— the researchers examined the copy number and parental origin of chromosomes in single cells from 23 different embryos. The Leuven team found that nearly three-fourths of embryos examined contained at least one cell with either partial or whole chromosome aberrations, similar to findings in human in vitro-fertilized embryos. To their surprise, the investigators discovered that 39% of all embryos contained cells with abnormalities of entire sets of embryos, for example, cells with only one set of chromosomes, either maternal or paternal, or three sets (one maternal set plus two paternal sets, or vice versa). While many of these embryos resulted from fertilization errors, such as two sperm fertilizing a single egg, the researchers observed that normally fertilized embryos also displayed this aberrant pattern. The scientists described the cell division event leading to the segregation of parental chromosomes as “heterogoneic,” or of differential parental origin. 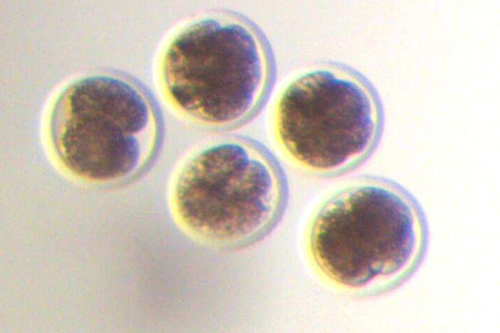 The research team was excited by their findings that normal fertilization can result in embryos containing cells with different parental sets of chromosomes because it is a new mechanism for chimerism, which was previously thought to occur only as the result of fertilization errors, for example, in the fusion of multiple sperm or eggs to form an embryo.